I don't want these blogs to dwell on the past but sometimes things happen to uncover memories long incorporated in the medley of experiences that make us who we are. A smell, a sound or an object removes the mantle of time. In the midst of last Saturday's Guardian, I noticed the Obituary of the Costa Rican born Mexican singer Chavela Vargas and suddenly it was 1979 again and I was in the mid Pacific on the rolling deck of a World War II minesweeper. Chavela Vargas was 93 and this by itself was surprising given her tequila soaked, gun touting, cigar-smoking persona on and off the stage. A lesbian in a homophobic world, hugely admired for her rasping and gut-wrenchingly dark renditions of 'rancheras'; songs where there are no heroes, only frustrated love and unrequited death. Unpalatable stuff for those brought up on the Momas and Papas or Elton John. Chavela Vargas was always present in the nicotine-impregnated wardroom of the Mariano Matamoros, vessel H01 of the Mexican navy. Every day for two long months, the same increasingly scratched record; a seedy soundtrack to a man's world. The slender cigar-shaped Matamoros began her life as the USS Herald in 1942 and swept mines in places as distant as Pearl Harbour and the Mediterranean, often in great danger. She was 67m long and less than ten wide, could reach 18 knots thanks to her two independent engine rooms and had a huge complement of 100 sailors: a very crowded 900 ton ship. She was given to Mexico in 1972, renamed Mariano Matamoros and plans were made to convert her into a survey and research vessel. But how to do it? After much debate and advice from the redoubtable Ingvar Emilsson - a Mexico-based Icelandic physical oceanographer - a box-like structure was added above the aft deckhouse to accommodate 18 scientists and labs were fitted out in the bowls of the ship below the foredeck. Midships, a hydrographic platform was rigged with a winch on the deckhouse and a small wet lab nearby. But all of this extra weight made her roll like a metronome. So, after much discussion (and the relief of scientists), the guns had to be removed and she was painted white, just like hydrographic ships in other countries. Of course, the time came when, in the middle of a naval review, an admiral asked “Why is that ship painted white? Paint her grey like the rest..” and so it was. And being captain of a gunless warship, regarded as a stallion with no … well, you get the point, was considered a duff posting, and - for each captain - hopefully a short-lived one! I boarded the plane in Mexico City with some trepidation; the first of two month-long cruises in February and June in the Pacific on an old naval warship – and the only chemical oceanographer. Our kit had gone ahead of us in a truck and our group decided to fly to Oaxaca and consider taking a local plane to Salina Cruz from there; the sweaty bus option of eight hours down precipitous winding roads was unattractive. In the event, the Aerolineas Oxaqueňas plane – a hand painted decrepit Dakota from an unregistered company – looked sufficiently scary to send us scurrying for the bus. Salina Cruz is a sultry place, ignored by tourists and mistreated by time. The church bells tolled as we left port; we were told later that this was the furthest the ship had ventured for years and some people feared the loss of loved ones. I was too busy to notice, stowing boxes of pre-weighed chemicals and tanks of distilled water in the cramped space and reassembling the six channel autoanalyzer that I had built from a machine destined for the scrapyard. We were heading for the Costa Rica Dome, an area of oceanic upwelling off the coast of Costa Rica and Nicaragua. This was Mexico’s contribution to the Global Atmospheric Research Project and we were to release weather balloons and make well over a hundred oceanographic stations. Our equipment was rudimentary by today’s standards: traditional casts of ‘Niskin bottles’ – a series of sampling bottles with thermometers that could be set to fixed depths to over a kilometre and closed by dropping a ‘messenger’ weight down the supporting cable – and a self registering instrument for measuring temperature, salinity and depth. I also used a fluorometer to measure surface chlorophyll (an indicator of phytoplankton) and nets for zooplankton. Nothing about this was particularly unusual. It was the circumstances and people that left a deep impression engraved in my mind. For a start, this was a military ship with a scientific crew from the National Autonomous University of Mexico, not so long after the 1968 massacre in Tlateloco Square in Mexico City, where hundreds of students were killed and persecuted. Our Chief Scientist, my friend José Barberán, had been deafened in one ear by machine gun fire and then detained in a secret jail, and he was not the only detainee from our team of scientists. Trained in Scripps, ‘Pépe’ (as everyone called him) was a brilliant physical oceanographer. The stern-faced Captain Poveda (not his real name) was deeply uncomfortable with his mission and hardly ever engaged in conversation with scientists and there was thus an almost electric tension on board as he regularly arrested members of the crew for relatively trivial misdemeanours. Luckily flogging was a thing of the past! A key victim of Poveda’s wrath was the cook. Poor guy hadn’t joined the navy to be a cook, he was assigned the duty and told to get on with it. With a crew of 80 (I never worked out how they fitted them in and ‘new’ people seemed to emerge like pale-faced moles from the engine room even after a month at sea) and dreadful supplies, he had a daunting job. Weevils in the flour and pork chops with a greenish hue. Too much chilli “ARREST THE COOK”. It was when food supplies started to run out that he became innovative. While we were doing ‘hydrocasts’ on the port deck, officers and crew were shark fishing on the starboard deck and shark fishing was a particular pleasure of the captain. Oceanic sharks have a high urea content and here the cook had his day, cooking the meat for hours to get the urea out and produce his “chan chan de Tiburon” which was a life saver (except for a blue shark that made everyone ill). Despite all of this, we were a pretty emaciated bunch after a month and one colleague ended up in hospital. We were determined to do something about it for the second trip. And that was only the beginning of the problems. Getting enough water for nearly 100 people is a real challenge when the ‘evaporator’ (the device that distils seawater for drinking) is nearly forty years old. 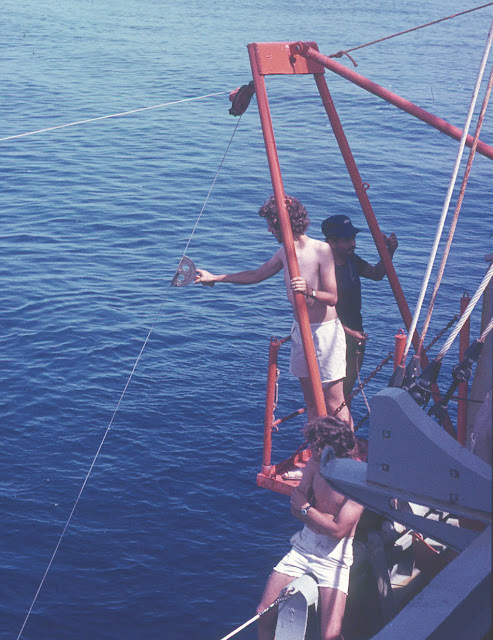 Our ‘box’ had a toilet and shower room accessible from deck but water had to be rationed, sometimes ten minutes a day for the entire scientific team. And we were the lucky ones; you can imagine the unsanitary conditions for ratings in the engine room in the tropical heat. We had our own routine. The first scientist would put a bucket half under the shower because the last one would always end up covered in soap. I will never forget the tannoy announcement: “OFFICERS, PETTY OFFICERS, SCIENTISTS AND RATINGS! SAINT JOSEPH IS GIVING YOU A FREE SHOWER. FORM ON DECK IN AN ORDERLY MANNER!” The watch officer took the helm and steered the ship for a particularly angry looking black line squall. By the time it had arrived there were eighty naked men on deck with their soap ready for action, some with small piles of clothes and soap powder. Five minutes of phrenetic activity and back into the tropical sunshine again. Traditional oceanography was often rather monotonous and demanding. We joked that an oceanographer’s hell would be a ghost ship doing bottle casts for ever and being woken up at odd hours of the night by “STATION!” It took a long time to get my autoanalyzer cranked up and all channels working (I could never get the ammonia channel to work; too much sweat and cigarette smoke). Once it got going, I would try to measure everything I had collected, even if it involved a 24 hour shift. We analysed the data as much as possible on the table in our ‘box’ and discussed sampling tactics for Pépe to negotiate with the captain. The table also became the centrepiece for little parties designed to let off steam and keep up the morale. While we were off the coast of Nicaragua, a revolution – the Sandanist revolution – was going on and we listened intently at the clandestine “radio Sandino; victory or death” on our short wave radio, cheering the victories and happy in the knowledge that we were one step ahead of the world’s press. The fall of the oppressive dictator Anastasio Somoza, was happening just a few miles away. "STATION!" I'm measuring the wire angle. With no thrusters we had to stop engines and drift on each station. By day 20, the pressure had begun. Poveda told Pépe that he was worried about the supplies and had put his men on shortened shifts because of hunger. “We have a mission to accomplish” he was told “and it is an international commitment”. We were also on one engine but that was normal, they never seemed to get them both working and when they did, sparks and soot would come out of one chimney and the offending engine would have to be shut down again. Then we were told that the fuel was running low and the men would have to pump it up with stirrup pumps. “We will finish our job” came the reply. Then eventually the day did come when the last station was over with a cheer and we steered for port. Of course, both engines suddenly sprang to life. They call it the “homeward breeze”; everyone knows that. By the second cruise, in June 1979, there had been a lot of lobbying to ensure improved conditions on the ship. A strong case had been made to ConNaCyT, the Mexican research council, for extra funds for food and this was meant to be inclusive of the entire crew, not just the scientists. To our surprise, they raised the navy food budget almost fourfold, arranging a payment directly to the captain to buy fresh provisions. We were approaching hurricane season and conditions could be tough. Back on board in Salina Cruz we were soon reinstalling our equipment. We were almost incredulous to discover menu cards in the officers’ mess with imaginative names for the dishes. Soon at sea, we began a 400 mile transect southwards, almost to the equator. There is a strange allure to the central Pacific; a long swell that is comforting in its steady regularity on a vast and seemingly empty blue sea. But the Costa Rica Dome is far from empty. It all starts with a combination of trade winds funnelled through gaps in the Central American part of the Rockies-Andes Ridge and the sharp northwards turn of an extension of the eastward flowing Equatorial Counter Current when it approaches the coast. The result of this is to spin off giant eddies as much as 200 miles wide, and to bring nutrient-rich deeper water towards the surface. These fertile eddy oases surrounded by a blue marine desert gradually drift offshore and eventually decay. The final ingredient to the mobile melting pot is dust brought by the wind that adds enough iron to trigger blooms of phytoplankton – tiny photosynthetic organisms that form the base of the food chain. 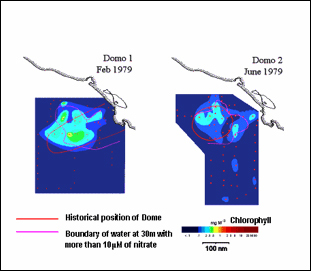 And few mariners crossing the Costa Rica Dome would notice the very slight greening of the sea. But they might begin to spot whales and sleek tuna boats. Our vertically hauled zooplankton nets revealed the missing link as we tipped increasing amounts of tiny creatures into glass jars and pickled them with formalin. On one occasion the whole net was bulging brim full of gelatinous salps (tunicates), organisms that are often barrel-shaped and consume phytoplankton. We thought that such a big haul was a complete fluke so we kept a small sample and tipped the rest back into the sea. But the same thing happened in the next three hauls; we were virtually sliding on a mass of jelly! This doesn’t explain the whales; you can’t survive on jellybeans and neither can whales. But the same patchiness that leads to aggregations of salps also happens with the zooplankton species that baleen whales depend upon and the Costa Rica Dome is a whale oasis for this reason. Matamoros was now off the area of Nicaragua and Honduras where the Dome is spawned. We were working deep into the night and although we had permission, this part of Central America was in turmoil. Suddenly there was a little flurry of activity from the bridge and the captain was summoned from his bed. “Seems to be a gunboat approaching from starboard” we were told “we can see it on the radar and it’s closing fast”. Military logic took over. Silent ship. Lights out. Drifting. But still the gunboat was approaching. When it was close enough, all lights – decklights, searchlights, floodlights, everything – was turned on and then off again. I can only imagine the reaction on the gunboat: “Holy s***, a battleship…”, or something like that. No time to see our gunless reality. Anyway, they did a tight 180 degree turn and left at full speed. The only time we cheered the captain! And that was an understatement. The big problem began one lunchtime a couple of weeks into the cruise. We were served a thin translucent liquid with a hint of grease floating on top. “What’s this soup?” barked the captain. “I have nothing to put in the soup” said the cook. “You’re arrested!” But so it was, yet another time, supplies were running out and the little menu cards became increasingly aspirational. Of course, we wanted to know why. How come the funds Pépe had negotiated for food had run out? “It’s that cook” we were told. “Money waster. He’s under arrest.” The cook, weary-faced and distraught, called Pépe late at night to show him all his carefully stored receipts and papers. This was a big risk for him and he had already forfeited the chance to return to his family when we returned to port (this was the reality of an arrest). He had spent much less than the money provided to supplement the provisions but that, he asserted, was all he was given. That night, our usual light-hearted meeting became an intense debate. “What can we do? How can we tolerate such behaviour and apparent corruption?” Finally, we decided on the best course of action; we would no longer eat in the officers’ mess. Effectively we were on hunger strike. But we had to survive another ten days at sea and complete our mission. Pépe informed the captain that we were relinquishing our rations so that they could be redistributed and that later we would demand an inquiry. Poveda was furious and over the next few days began to vent his spleen by accusing us of subversive behaviour, even warning of a court marshal. Fearful of a mutiny, he even made the officers take out their firearms and clean them on deck. The atmosphere was electric. Our protest was passive though and we continued to work as normal. The ship steamed on. Again we resisted stories of low fuel and insisted that a job had to be done. Night stations were the highpoint. While a small group of colleagues did bottle casts on the port deck, a larger group would be aft, fishing for squid and we became increasingly expert at making lures and catching them. Squid are aggressive creatures and will go for a ring pull from a beer can if it has a hook on it. A couple of our number had brought large bags of limes on board (fearing scurvy no doubt!) and we marinated the squid and pretended they were a delicacy. Sometimes we simply had to eat them raw. Sometimes late at night we were visited by some of the crew from the engine room who had a supply of maize flour and would bring presents of hot tortillas. We were shown immense kindness by these tough but caring souls. On the Matamoros, I learned more than tropical oceanography. It was a lesson in resilience, companionship and human dignity. I have no doubt that we did the right thing. As a foreigner I was particularly vulnerable. Article 33 of the Mexican Constitution states that “foreigners cannot in any way meddle with political matters in the country” and any violation of this can result in immediate expulsion. My friends carefully shielded me from any political undertones and our actions were about dignity and not politics. I decided not to tell this story until everyone had retired. We finished the cruise but it was not our last trip to the Costa Rica Dome. We eventually docked in Salina Cruz again and unloaded our equipment to the warm smiles of the crew and frosty stare of the captain. My memories of the last few days at sea have become hazy; we were not in a very good state. Ironically, I was given a letter to inform me that I had completed some 28 “singladuras” – days at sea that I could count as military service. I keep the letter somewhere, just in case! Pépe Barberan died of cancer in 2002 in the middle of a rising political career and his ashes were scattered at sea. We bade our farewells a month earlier. A few years ago when I was working in Plymouth, I attended a talk given by Daniel Ballestero, a visiting scientist from Costa Rica. He mentioned how the best series of observations in the region had been four Mexican cruises in the early 80s but nobody knew where the data was. I took him to my office and pointed to the yellowing boxes packed with data logs and rolls of paper from chart recorders. We managed to get some funding from the EU and he came to work on the records for three months. Later, colleagues from Mexico pooled the physical oceanography data and Dima Aleynik (now also at SAMS) travelled out for several weeks to recalibrate and quality checked the data and model it. He produced a modern data archive and we still have every intention to publish an atlas of the region. So if you see some cardboard boxes in my office, you know what’s in them (and there are other cruises too!). "Hay que saber sentir, que hay que saber luchar para ganarse el respeto de otros y respetar a esos otros". You have to know how to feel, you have to know how to fight to gain the respect of others and to respect others.